Last week I took a ride up to St. Charles to check out the Scrapbook Expo, the new Basic Grey Eerie Paper Pad was calling my name. Of course I couldn't buy just one pack I had to buy the new Indian Summer too - I'll share that in a post next week. 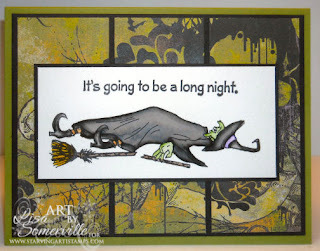 I don't really create a lot of Halloween cards, but just LOVE the patterns in this paper pack, so I paired it up with the Witch Trio set from Starving Artistamps. The image is stamped in Black on Watercolor paper, then colored using the Marker Watercolor Technique. Speaking of Techniques, be sure to stop back here on Monday, as I'll be joining some of the other Designers from Technique Junkies for a Blog Hop using Techniques from new CD. Follow us on the Blog Hop, collect your clues and you could be entered to win a great prize! Extremely cute! I love halloween and your colors and witch sing to me. I love it! LOL, very cute, and yep yep yep, the paper looks great! I just love this card!!! We can all feel like this eh? LOL!